The third installment in my series of blogs leading up to the Majority Rising show which I’m curating and participating in at the Artist Archives of the Western Reserve for Women’s History Month. Majority Rising, subtitled, Cleveland’s Female Gaze, opens March 12th and features work by legendary Cleveland figurative artists, Shirley Aley Campbell, Lee Heinen, Kathleen McKenna, Marsha Sweet, Marilyn Szalay…and me, Judy Takács. My contribution to the show will be the portraits I am painting of the living artists in this stellar grouping. Today, I’m inspired by Master Printmaker, Marsha Sweet. 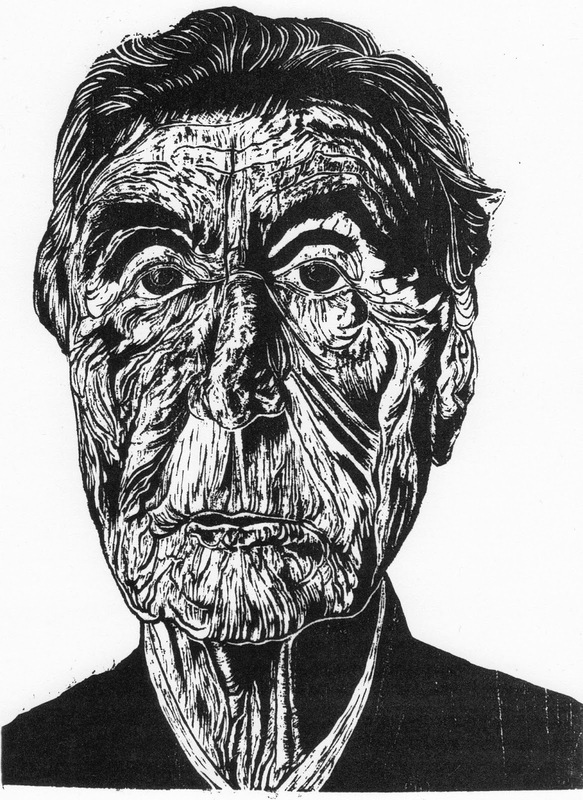 There is no forgiveness when you’re making a woodcut print. It’s black or it’s white. It’s cut or it’s not cut. And, while you’re cutting you never actually see what will be black and what will be white. You must instinctively know, and be able to predict from subtle shades of beige on the giant wood plank you’re carving into. Also, your hands must be strong and precise; the hands of a master crafts-person and a master draftsperson. Marsha told me that you eventually get into a Zen-like rhythm with your cutting tools, but that Nirvana goes hand in hand with hours of intense hard work. The drawing and carving time from her initial drawing to bon a tirer (ready to print) often takes about 160 hours; some of her largest woodblocks are 36 x 20. Marsha’s creation process is vastly different from my own; oil painting being eternally changeable with instant gratification at your fingertips. And the physical strength required only comes into play when framing and transporting. During creation, I don’t get much of a workout…besides stepping back for a look. For each of the Cleveland art legends whom I’m painting for the Majority Rising show, I made a commitment to inhale deeply that which they were inspired by in order to make my painting. So, from Marsha I took inspiration from the monolithic dark shapes she uses as expressive pedestals for her intricately carved faces and hands. And, these intricate carvings…along with her own beautiful and expressive face…inspired my painting of Marsha Sweet. When I visited her studio in November, we discussed art, feminism, raising kids and her participation in the Equal Right’s Amendment Marches in the 1970s (remember the ERA? It seemed like a slam-dunk back in the day before we all got comfy and complacent, but it never did pass…though that’s a discussion for another day). We also discussed the almost exclusively female subjects of her woodcuts. Her work draws inspiration from strong, creative and iconic women from recent history; George Sand, Georgia O’Keeffe, Gertrude Stein, Clara Bow and more. As we talked about how she depicted ballsy chicks in her art, the discussion inevitably turned to my own Chicks with Balls project. 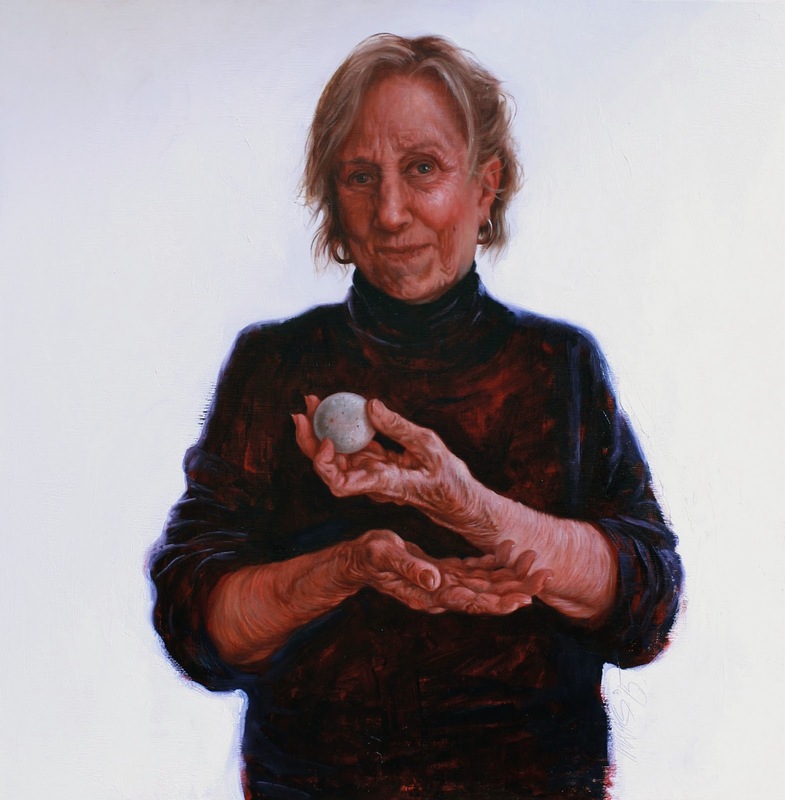 In posing for my portrait of her, Marsha grabbed a naturally polished and perfectly round smooth stone she had picked up on the shores of Lake Erie. 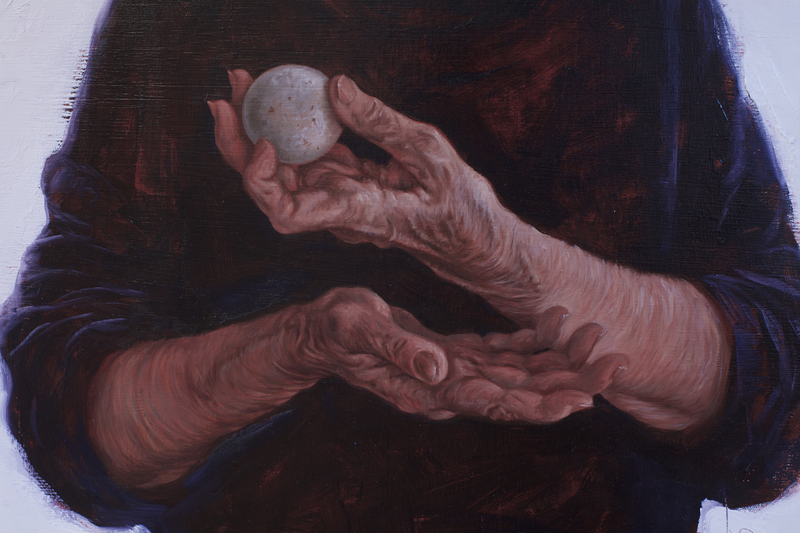 She held this round “ball” in her beautifully weathered and skillfully expressive hands. To reserve your spot and buy your ticket to any of the studio tours, email Katelyn Gainer, Gallery and Administrative Assistant at kgainer@artistsarchives.org or call 216.721.9020. Read the first Majority Rising blog featuring Shirley Aley Campbell, and the second one which talks about Lee Heinen.